A tape measure is a key tool in the toolkit, and many of us would feel lost without it. If you find yourself without a tape measure, maybe you lost it, forgot it, or simply don’t have one, then there is still hope! There are some tips and tricks to measuring without a ruler or tape measure. If you don’t have a tape measure then the key is to find something you do have that is a known dimension. If you know the dimension of any other object then you have a simple ruler. Use these everyday objects to measure in place of a ruler or tape measure. A sheet of letter paper is exactly 8.5″ x 11″ (215.9mm x 279.4mm) and a sheet of legal paper is exactly 8.5″ x 14″ (215.9mm x 355.6mm). Use the short edge or the long edge as needed. Keep in mind that craft paper or other non-standard size paper will not be the standard letter size and cannot be used unless you have the exact dimensions of the paper(hint: it may be on the package). A dollar bill is 2.61” x 6.14” (66.3mm x 156mm) and is something you likely have in your pocket. Keep in mind that a dollar bill is just over 6″ long and not exactly 6″. You can also easily turn a dollar bill into a ruler to make shorter measurements. If you’re short on bills but have some change, look for a quarter. A quarter is .955” (24.26mm) in diameter and is great for shorter measurements. If you don’t have any money but you have a credit card then consider that credit cards are a standard size as well. A credit card measures 2.125” x 3.370” (53.98mm x 85.6mm). If you own a printer then you can actually print out a very accurate ruler or tape measure. See our printable 60″ tape measure or our 12″/30cm printable ruler. Believe it or not, you can actually download an app to measure items by taking a photo. Check out the EasyMeasure app. If you’re measuring a room then check out the RoomScan app, which can measure your room and create a blueprint of your home. If you literally have nothing then you can at least use your body to make some close measurements. The average person measures 15″-18″ from the tips of their fingers to their elbows and the average foot is 10″-12″. These tricks work great when you’re in a pinch. If you’re planning ahead then consider picking up a tape measure. 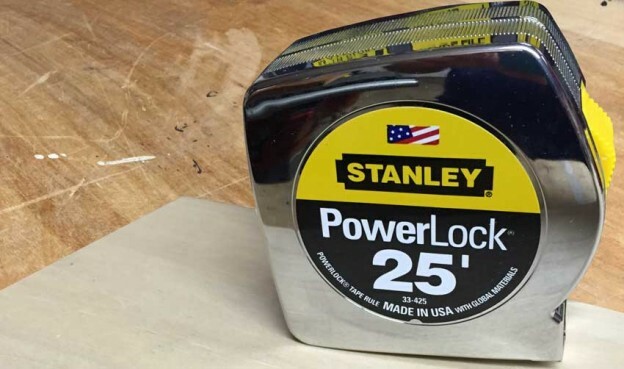 A Stanley Powerlock is a great cost-effective choice.